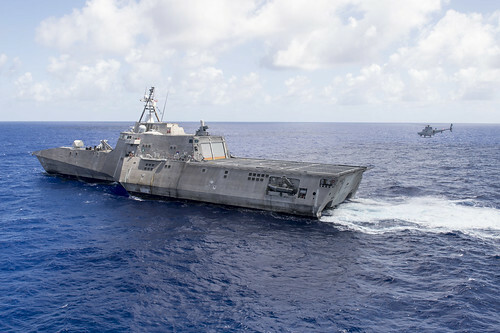 SINGAPORE - The littoral combat ship USS Coronado (LCS 4) sailed from Changi Naval Base, Nov. 30 for a routine patrol following a scheduled maintenance period. Coronado arrived in Singapore on Oct. 16 following a busy operational schedule that included participation in the 2016 Rim of the Pacific (RIMPAC) exercise off the coast of Hawaii and a Pacific Ocean transit. 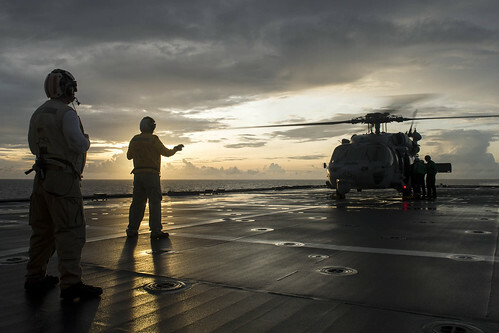 The ship was deployed to Southeast Asia to partner with regional navies and enhance maritime security relationships. While underway, USS Coronado’s crew will train and sharpen their seafaring skills in preparation for operations and cooperative security engagements scheduled during the ship’s rotational deployment to the Indo-Asia-Pacific. “We have a significant amount of unit-level sustainment training scheduled this week, to include man overboard drills, quick-draw serials, gun shoots, boat operations, and engineering casualty control exercises,” said Cmdr. Scott Larson, commanding officer of USS Coronado. “I'm extremely proud of the attitude and focus the team continues to apply as we take Coronado through her maiden deployment to the region." The ship's maintenance availability began in early November following a local underway period for training and operational testing. Many of the ship’s departments worked with external technical representatives to complete work and repairs to ready the ship for underway operations. Lt. Cmdr. Evan Young, officer in charge, Helicopter Sea Combat Squadron (HSC) 23, Detachment 4, talked about the importance of “D” phase maintenance. Currently on a rotational deployment in support of the Asia-Pacific Rebalance, Coronado is a fast and agile warship tailor-made to patrol the region’s littorals and work hull-to-hull with partner navies, providing 7th Fleet with the flexible capabilities it needs now and in the future. On behalf of Commander, Task Force 73, Destroyer Squadron 7 conducts advanced planning, organizes resources and directly supports the execution of maritime engagements such as the Cooperation Afloat Readiness and Training (CARAT) exercise series, the Naval Engagement Activity (NEA) with Vietnam, and the multilateral Southeast Asia Cooperation and Training (SEACAT) exercise with Bangladesh, Cambodia, Brunei, Indonesia, Malaysia, the Philippines, Singapore, and Thailand. U.S. 7th Fleet conducts forward-deployed naval operations in support of U.S. national interests in the Indo-Asia-Pacific area of operations. As the U.S. Navy's largest numbered fleet, 7th Fleet interacts with 35 other maritime nations to build partnerships that foster maritime security, promote stability, and prevent conflict.